Sometimes you don't really need to write a lot to write a really good book. 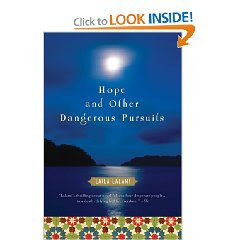 Case in point - Lalami's debut novel Hope and other Dangerous Pursuits. The fact that Lalami manages to evoke such sadness and hope in such a petite book speaks volumes for her talent. The novel focuses on 4 individuals who are trying to illegally cross the international waters from Morocco to Spain. What's different about this novel is that there are essentially only 8 chapters, a "before" and "after" for each character. All of the characters are trying to reach Spain in an effort to create a better life - whether they actually achieve that goal remains to be seen. Whether it's Halima, a mother trying desparately to escape her abusive husband, or Murad, who doesn't want to be the disappointment in the family, in the end, they all must accept the consequences of that fateful voyage to Spain. A quick read, but in this case, quality trumps quantity.